LinkedIn wants to be part of your breakfast. You know that part where you open your tablet, review the news in Pulse. Or you might be looking at your LinkedIn update stream on your home page. Both Pulse and your LinkedIn stream of news have more noise than the Wall Street Journal, right now. But you are in more control of what you read. The advertorial in a print magazine was deliberately made to look similar in type to the editorial page. Although titled "Advertisement", some readers who regularly ignored display ads were interested in the conversational format of the advertorial. So, they read & some bought. The newspaper made money matching a supplier with a customer. LinkedIn is doing something similar. It is allowing franchise brands to post their advertorials directly into your LinkedIn update stream. These sponsored updates are different from the LinkedIn paid ads which you see around the edge of the LinkedIn, usually in widget on the right hand side. Last year, when the sponsored update program Joe and I tried out some of the features out -using our company page. We were interested in acquiring a larger reach for our contributors, by buying impresssions. First, buying impressions is relatively simple to do. You figure out what your target audience is, fill in a few buttons and then you are presented with screen that looks like this. 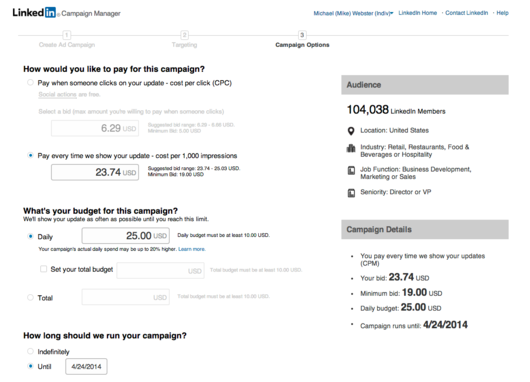 Ok, this campaign would cost us $23.74 for each 1,000 impressions we want to buy. We are targeting the 104k LinkedIn users in Restaurant or Hospitality industry, Senior Director or VP and above. We are also targeting it to the people who are in business development, sales or marketing. Director level or higher. So, 10K impressions would cost us $237.40. It is a brilliant deal, compared to the alternative of using press release software. Which many franchisors are using to get their name out there. If your franchise brand is using press release software, what does it cost & what do you get? Here is typical price list. So which franchisors are spending money on press release software? Well, put in "franchise" in the searchbox and you will be a list of franchisors trying to get their name out using press release software. 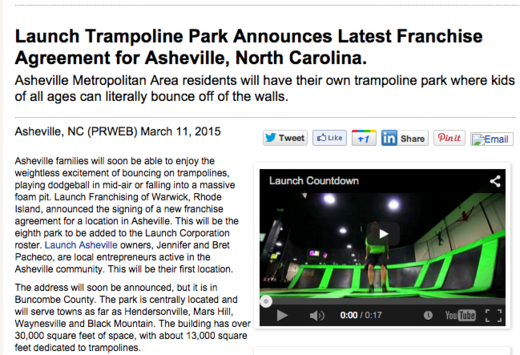 Here is a typical press release, from Launch Trampoline. Ok because they have embedded video, we can calculate that they spent at least $500 to use the software. This one time. But who the heck is going to read this? 1. You have to get the piece picked up by a local journalist. 2. You have to get the local journalist to find the piece interesting. 3. The local journalist has to decide that they have space to run the article as placement. Finally, you need qualified buyers -either consumer or business- to look at the article. Which will run without the video in most cases. Worse, is that if you do all this & the time isn't right for your reader, you have wasted your advertising budget. If you are targetting a professional audience, then the largest group of readers is on LinkedIn. 1. 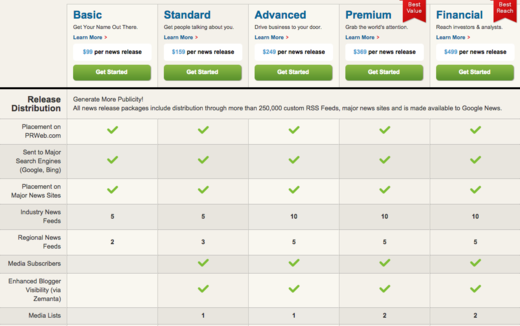 You can target the exact group of readers you want. No waiting around for a journalist, their editor and the paperboy to deliver your message. 2. You can send them messages with rich content, like videos. 3. You can keep in touch, once they have read your message or viewed your video. Because your customers buy when it is convenient from them & not when it is convenient for you. When your brand needs to make an impression in LinkedIn, send me an email in LinkedIn. Use the title "I want to make an impression." Or, you can just sign up for more of our ideas about how to publish on LinkedIn. Just click here and Mail Chimp will take over. Thanks. Oh, and we never give out your email.